I am severely allergic to bee venom, so I’ve always been careful when gardening to stay out of the flower beds during the times of day when bees are most active. Sadly, that’s been easy to do this year because there are no bees in my garden, save for some tiny, tiny bees that my grandma used to call “sweat bees.” There are no honeybees or bumblebees, just a lot of large scary-looking brown wasps that, like cockroaches, look as though they could survive an apocalypse. Perhaps we are on the brink of one now. As gardeners, we see changes in nature up close in ways that others don’t. I can tell you (and I’m sure you have plenty of stories, too) that seven years ago our gardens were filled with bees and butterflies. In that short time, both have all but disappeared. Many of the gardeners I know are saying the same thing and, without exception, our talks reflect a growing mix of sadness and worry about the future. It’s one thing to read an article about how vital pollinators are to food production and quite another to walk out the back door to find normally bountiful tomato, cucumber and squash plants nearly devoid of fruit. Leaves for dinner again, anyone? 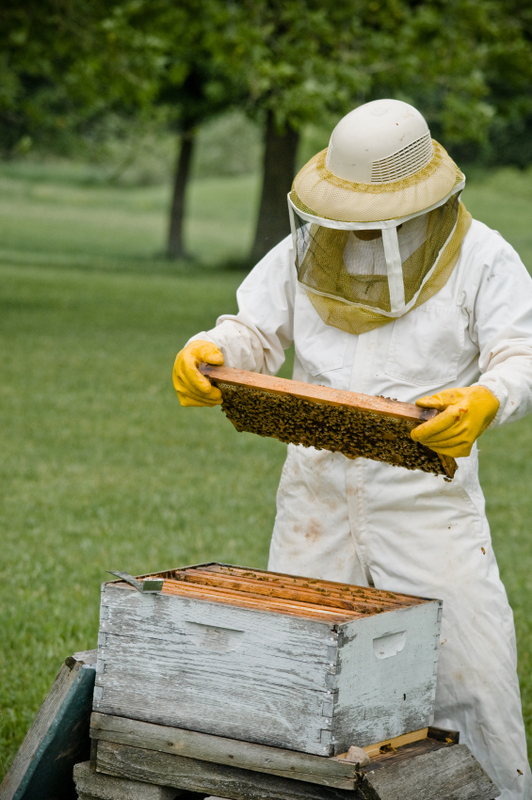 If you have ever thought about getting into beekeeping, now is the time to start. Ordinances vary by city and state, but in Minneapolis, beekeeping has been legal since 2009 and it really took off this year in May when the Minneapolis City Council approved an ordinance making it easier for urban beekeepers to get permits. Ever since then, more and more bee boxes have been buzzing on rooftops across the city, including some at high-profile locales such as Minneapolis City Hall, the Minneapolis Institute of Arts and Weisman Art Museum. Honeybees are not aggressive, and backyard hives can be managed safely by trained homeowners. But rooftops are an attractive option for urban bees and their keepers because bees tend to fly up and out when exiting their boxes, lessening interaction with people down below, says Becky Masterman, who co-coordinates the Bee Squad with fellow beekeeper Jody Gerdts. Started by University of Minnesota bee expert Marla Spivak in 2010, the Bee Squad aims to help foster healthy bee communities in the Twin Cities through education, training and data collection on the health of urban colonies. If you’re asking yourself whether you really need training to keep bees, the answer is yes. Masterman explains: “Keeping bees is really hard. It is both an art and a science, and there is no way to learn to do it right from a book or a weekend class. It really helps to have somebody next to you watching and guiding you as you learn.” So, for the sake of the bees, and yourself and your neighbors, please take the time to understand what you’re doing before rushing into beekeeping. Hmm, to bee or not to bee. Think I will leave it to the experts. But I do feel sad for the loss of urban bees and my rural garden is bee-deficient, too. Alas. Hand pollinating is a drag. I have an Australian Stingless Bee hive on the front window of my Sydney apartment facing east. We don’t harvest the honey because the small amount that they do produce they need through winter when they are hibernating. We have them purely for pollination of our own plants and we are certain, for our neighbours plants and the local native species. They are self sustaining and only require the hive to be split which we haven’t had to do yet. They are such a joy to have and I love watching them fly away in the morning and return in the afternoon with their little bodies full of pollen. Thanks for your note. I’m going to see about trying to find a stingless bee colony to live at my house. That’s a good idea. Our garden club is having a talk on such subject next month, so will eagerly listen to see how I can get a colony, too. Thanks Carmel and Meleah.